Raaka Chocolate is reluctant to get caught up in the labeling politics of today’s chocolate industry, in part because the labels that exist don’t quite describe the chocolate they make. Roasting is fundamental to almost all of the chocolates we can buy on today’s American shelves, and that’s where Raaka’s trademark virgin element comes in: Raaka skips the roasting process to build flavor profiles and complex chocolate bars around the natural flavors of the uncooked cacao beans. Since roasting is what gives most chocolate bars that “chocolate-y” flavor American consumers have come to expect, Raaka bars can take a little getting used to. And while roasting doesn’t necessarily eliminate the naturally occurring flavors found in an unprocessed cacao bean, it certainly does homogenize them. Foregoing that recognizable brown taste allows Raaka to focus in on the inherent flavor profile of each bean, unique to every varietal and regional ecosystem where Raaka sources. So if the beans are uncooked does that mean Raaka chocolate is a raw food? “Out of respect to the raw foods community, we don’t call our chocolate raw,” said William Mullen, Marketing Manager at Raaka Chocolate. Even at origin, before they even smell the Red Hook air, unroasted cacao beans can still be subject to temperatures as high as 130 degrees fahrenheit through natural processes like fermentation and drying under the equatorial sun. Raaka works with cooperatives in the Dominican Republic, Bolivia, and Peru, to name a few, and head chocolate maker Nate Hodge visits these farms regularly. Virgin it is, then. 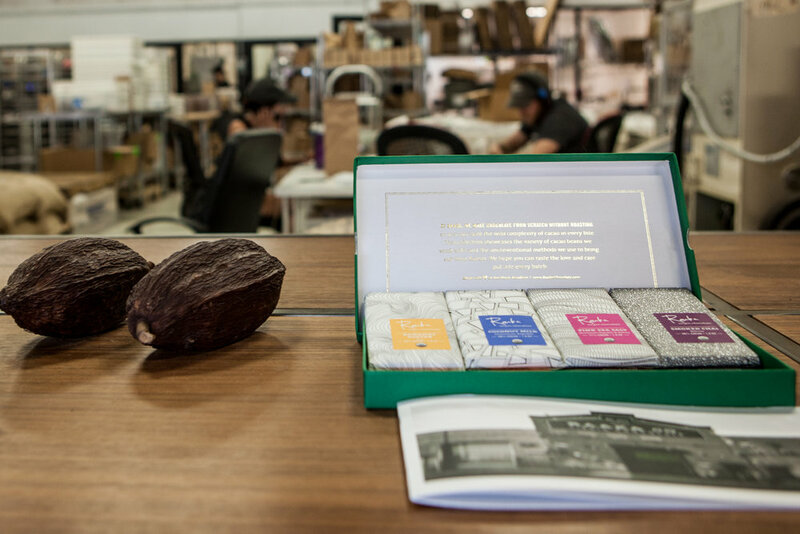 But even with direct bean sourcing and a literal bean-to-bar process in the Raaka factory, the bean-to-bar label still doesn’t feel quite right to Mullen: “I don’t like the term. I don’t think it’s definitive enough and it’s very co-optable. I like ‘made from scratch,’” he said. It’s a passing comment, but one that represents Raaka’s commitment to carving out their own corner of the chocolate industry without being swayed by anyone else’s mold. The processes that support Raaka’s catalog of flavors further define the company’s individuality. While they’re not roasting the beans, Raaka chocolate makers do process many of their beans in boiling and aging concoctions in order to infuse and enliven those natural flavors. The beans that go into a Cabernet Sauvignon bar are steamed over its namesake red wine, Bananas Foster beans are steamed over rum, and Bourbon Cask Aged beans are actually aged in bourbon casks before any of the specific bar-making chocolate processes begin. The Raaka subscription program, First Nibs, is also a big contributor to the company’s flavor experimentation. Green Tea Crunch, their newest bar, is made with single origin cacao from Eastern Congo and puffed quinoa, taking its inspiration from traditional Japanese Genmaicha. Before it made it into Raaka’s seasonal collection, Green Tea Crunch was a First Nibs bar sent to subscribers for their feedback. Hibiscus Cinnamon, the limited edition seasonal predecessor to Green Tea Crunch, was also a First Nibs trial once upon a bar. Chocolate maker Hector Hernandez dug into his roots in Puebla, Mexico to find inspiration for the Peruvian cacao recipe made with hibiscus, cinnamon, and vanilla. 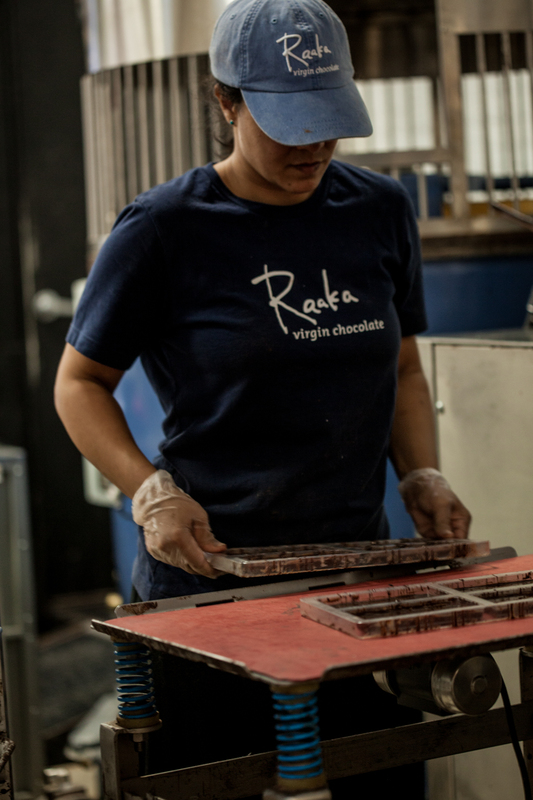 On our tour of the Raaka factory, Hernandez was one of the chocolate-makers hard at work, elbow-deep in a new batch of something special. We tasted with Mullen and Hernandez and others, peeking into vats of melting chocolate and nibbling at raw beans. 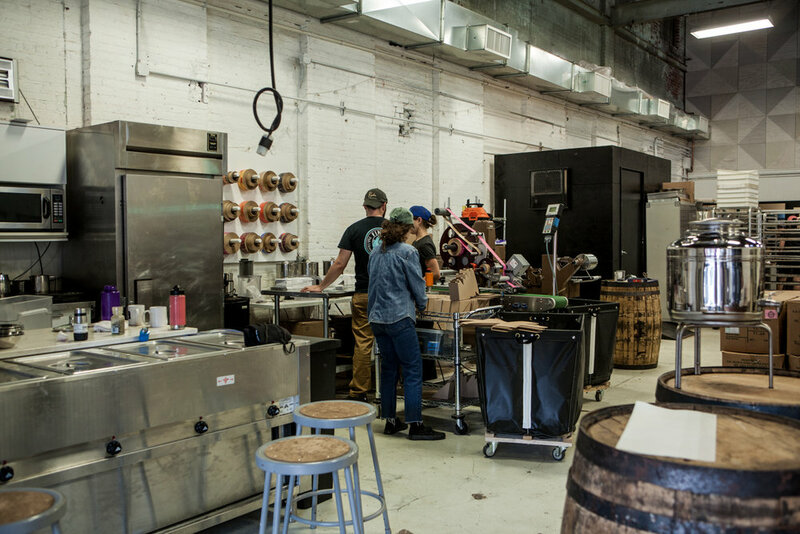 Raaka has repurposed industrial machinery not originally intended for chocolate making to suit their high-tech needs and quality standards throughout the factory. The factory’s winnower is a homemade device by all accounts exclusive to Raaka, air jets and lasers within repurposed from their intended use for rice processing. Cocoatown grinders are well-known to the contemporary craft chocolate maker, but they are still all upcycled from spice mill machinery. 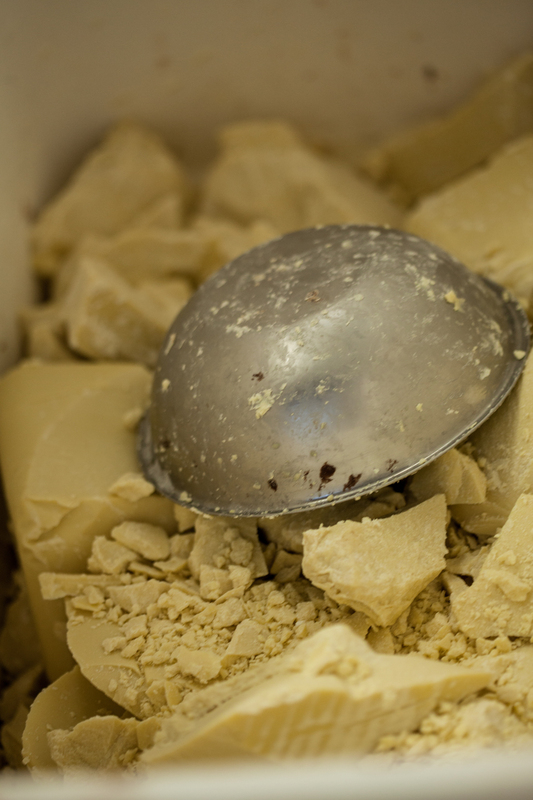 A repurposed ink refinery machine helps churn out finished chocolate before it is shaped and set in molds. I make my obligatory Willy Wonka comments as the factory tour winds down. We stand around the Sapal wrapping machine, one of only two pieces of machinery in the factory actually created for use with chocolate. A mismatched paper wrapped catches my eye as the bars pop out of the end of the machine, and I am quietly assured that there are plans in the works to tuck away a few golden tickets. 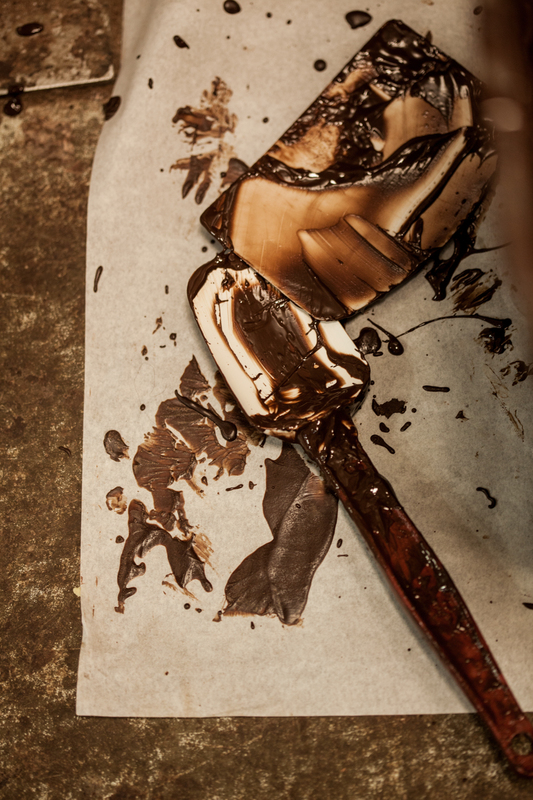 The unexpected flavors that constantly come out of the Raaka factory have proven that surprises are worth waiting for. In the meantime, the ghost pepper tastes like ghost pepper!